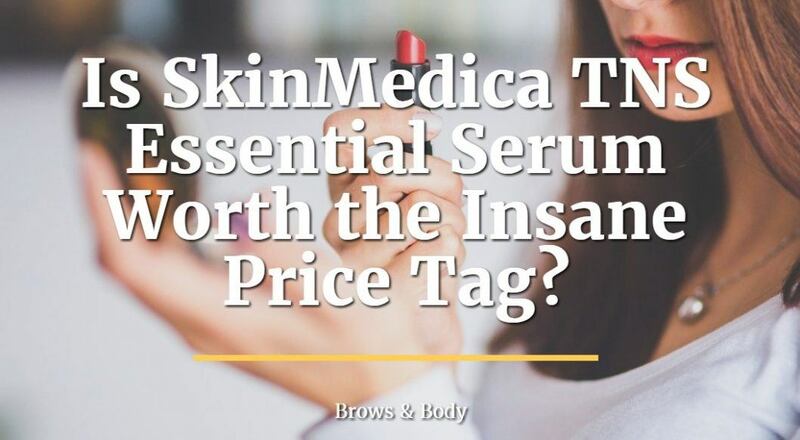 >> Is SkinMedica TNS Essential Serum Worth the Insane Price Tag? What is SkinMedica TNS Essential Serum? So what exactly is the TNS essential serum? It's actually two products combined into one (part of the reason for the large price tag). It contains two chambers which are hidden inside the larger tube, but as you express the product it will deliver a combination of both products and combine it on your behalf. This technique allows for the contents of the chambers to stay safe and preserved until treatment. Because not all ingredients react well or play nice with one another! Other ingredients need certain "conditions" to stay safe and effective (like Vitamin C). So if you have two separate chemicals that both require different pH conditions or stabilizers then putting them together render one inactive. This problem can be solved by placing them in two separate chambers and only combining them when necessary. That's the idea behind this product. But which products does it contain? It actually contains two separate products: TNS Recovery Complex and APS Corrective Complex. We will go over the ingredients in detail below but for now just realize that the recovery complex helps naturally promote skin care growth and the APS corrective complex contains a host of special anti-inflammatory agents, peptides, growth factors and vitamins (tons of GREAT ingredients). This essential serum is often recommended as one of the best products to help reduce the appearance of your skin, but why is it so effective? The secret (well not really a secret!) to why it works has to do with how it is formulated and the ingredients that it contains. The effectiveness of any skincare product always boils down to the ingredient list. And while this may seem like a no-brainer it's not something that most people truly understand. The reason for this has to do with how cosmetic products are packaged and how they are labeled. Most producers make their product labels seem similar to one another in an attempt to confuse the consumer (in this case you). They will occasionally use deceptive marketing such as not showing the concentration of a certain ingredient or by calling an ingredient by a different name. There are many ways to formulate Vitamin C in products but the most effective formulations of Vitamin C include Ascorbic acid and tetrahexyldexyl ascorbate. Often you will see other formulations identified as "Vitamin C" even though they are nowhere near as effective as the forms mentioned above. This is further complicated by the fact that formulating ingredients (such as ascorbic acid) in the right way is very expensive. So some products may look abnormally expensive when compared to others even though they "state" they have the same ingredients. Hopefully this is making sense! The main idea here is that the TYPE of ingredient, the WAY it is formulated and the CONCENTRATION all come together to help make the product work. The essential serum discussed here is so effective simply because it contains ALL high quality ingredients and a great combination of anti-oxidants, vitamins and growth factors. No product is perfect and no product (no matter how good it is) will work on all skin types. But even with this in mind you can expect this essential serum to work in about 80-90% of people who use it. The 90% value that I am referring to is based on testing done with the company itself (which may be slightly biased). But if you contrast those results with unbiased reviews around the internet you will see that they are probably fairly accurate. Because we don't have unbiased data I would say it's probably more realistic that it will work for about 80% of people. Most high quality products work in about 70% of people who use them which is about 7 out of 10 people. Anything higher than that is considered VERY good. Compared to most cosmetic products this essential serum contains at least 11 different active ingredients (not including inactive ingredients). This is about 5-6x more active ingredients than most other high end cosmetic products. Even some of my favorite products, such as iS clinical active serum, contain 3-4 active ingredients. So in this case you really get what you pay for. Let's break down the ingredients by the chambers. Human Fibroblast Conditioned Media - Fibroblasts are special cells which help promote healing, collagen production and other important functions in the dermis of your skin. Placing this media in a serum may help promote the regeneration of collagen and elastin that is normally lost during age and help restore youthful skin. The first chamber contains the exact same ingredients in the Recovery complex also sold by SkinMedica. Peptides (Palmitoyl Tripeptide-5, Hydrolyzed Silk, Dipalmitoyl Hydroxyproline) - Peptides help to also promote collagen and elastin production, improve the speed at which you heal, help fight fungus/skin bacteria and help reduce fine lines and wrinkles. You can read more about peptides and why they are so beneficial here. Antioxidants (Ergothioneine) - Ergothioneine is an amino acid which can be used by your cells to help fight cell damage and Ultra violet oxidative stress. You can think of this as a natural way to boost the effectiveness of existing cellular defense against normal aging and damage. Ubiquinone (CoQ10) - You may be familiar with CoQ10 which is an enzyme that is often taken by mouth. Ubiquinone can also be applied topically to the skin where it acts as an anti-oxidant which helps reduce stress to the skin from normal day to day damage. Camellia Oleifera Leaf Extract (Green tea extract) - Green tea extract is a polyphenol found in green tea which can help prevent environmental and chemical damage to the skin. Tetrahexyldexyl Ascorbate (Vitamin C) - Vitamin C is probably one of the best vitamins you can put on your skin and acts as a natural anti-aging ingredient which also helps to brighten and lighten the skin. Vitamin C should be a part of ALL skin care routines. If using Ascorbic acid you'll need at least 15% Ascorbic acid for best results, if using tetrahexyldexyl ascorbate you'll need at least 7% concentration. Both formulas work better than other cheaper formulations of Vitamin C and have been studied in clinical trials. Tocopheryl Acetate (Vitamin E) - Vitamin E can help moisturize the skin, improve healing time, reduce skin damage and even lighten the skin. Vitamin E is often used as a base to hold other fat soluble ingredients and is included in MANY skin care products. Rubus Fruticosus Leaf Extract (Blackberry extract) - Blackberry extract may help prevent sun damage by reducing the inflammatory response in the skin. Saccharomyces Ferment Lysate Filtrate (Yeast) - Beneficial yeasts and probiotics help normalize bacterial concentrations on the skin and reduce the risk of getting acne and other skin disorders. Alpha-Arbutin - Alpha arbutin is an all natural and effective skin lightener. It is designed to help normalize complexion and even skin quality. It's also effective at treating hyperpigmentation from sun damage, melasma, acne and so on. You can read more about the benefits of using Arbutin here. Hyaluronic Filling Spheres - Hyaluronic acid helps your skin absorb and retain moisture. High quality hyaluronic spheres help your skin look more plump and retain the moisture you had when you were younger. This second chamber contains the APS corrective serum which contains probably the most important ingredients. As you can see each of the ingredients listed here has clinical studies backing their use and showing that they are effective. If you are new to using high end products then I would take a minute to dig through some of the posts and really read and research the ingredient list so you know just how beneficial each ingredient actually is! This essential serum is generally very well tolerated because most of the ingredients listed are Vitamins and plant based. Having said that some people with sensitive skin may react to certain products. This doesn't happen very often, however and if it does it can often be treated by allowing your face and skin time to adjust. If you experience any of these side effects simply reduce the frequency with which you are using the product and they should fade over time. You can then start back up with a smaller amount and use a less frequent dosing schedule (something like every other day). TNS essential serum can only be sold through authorized retailers only. Because of this there is a risk of purchasing counterfeit or fake products if you buy them from a non authorized source. Basically if you find a product from any of the places listed above you risk purchasing a fake product that has been diluted or manipulated. For this reason it's best to avoid them all together. So where can you buy them? #1. Purchase them from a cosmetic dermatologist, medical spa or plastic surgeon. #2. Or, the better options, purchase it from an authorized seller on Amazon which has been vetted by Amazon. 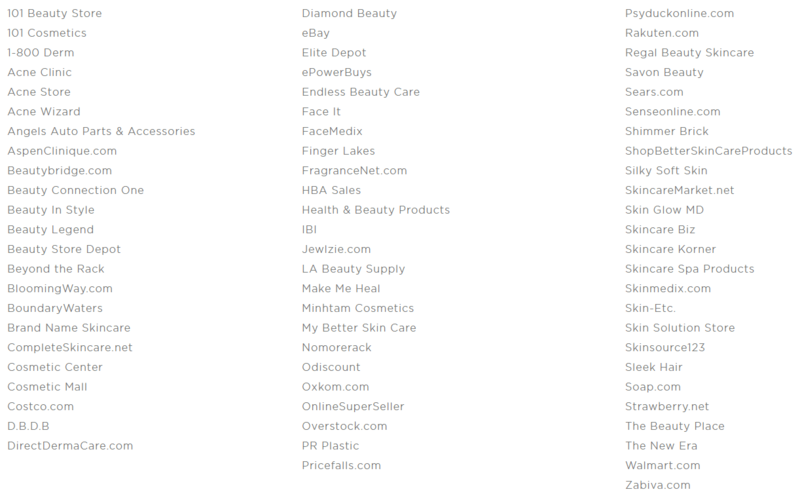 You can now purchase SkinMedica products from Amazon provided they show the "professional beauty" or "luxury beauty" tag underneath the price. If you prefer to purchase it directly from your dermatologist or plastic surgeon you can definitely do that too! Just make sure you find the route that you feel comfortable with. Applying and using TNS essential serum is actually very easy. When to use it - It's best to apply in the morning AND the evening after both cleansing and toning your skin. Cleansing will help exfoliate your skin and allow better absorption of the ingredients. Toning helps bring back the acidic pH of the skin which ensures proper vitamin C usage. Where to apply - You should apply directly to your entire face and neck/chest/back of hands if desired. The serum will work anywhere you have damaged skin so don't be afraid to put some on the back of your hands and upper chest area. You can directly dispense the ingredients into your hand but make sure to "blend" the ingredients together before applying to your body. It's helpful to give the ingredients a few swirls in your fingertips to ensure proper mixing of both chambers and ingredients. Using it this way daily for at least 4 weeks should result in noticeable improvement in your skin. Skinmedica TNS Essential Serum vs Recovery Complex: Is there a difference? The main difference between these two products is that the TNS essential serum contains the entire recovery complex product PLUS the APS corrective complex. The main difference is that the TNS essential serum ALSO contains the APS corrective complex in one of its chambers which is combined with the recovery complex when using it. When looking at both products you should determine which one works best for your skin. So who should use the TNS essential serum vs the recovery complex? The best way to break it down is by age and by the maturity of your skin. Because the Essential serum is so effective for anti-aging and replenishing collagen/elastin in the skin it's probably best to use this product if you are over age 50 or have severely sun damaged skin. The recovery complex is probably better to use if you are younger (less than 40) and interested in keeping your skin looking younger for longer. Remember that the essential serum contains the APS recovery complex which is really just a combination of growth factors which help stabilize the skin and further help reduce the signs of aging and skin damage. TNS Essential Serum may be one of the best anti-aging and all around cosmetic products available on the market. The reason for this has to do with how it is formulated and the 11 major clinically tested ingredients that it carries. But just because it works well for most people doesn't mean it will work well for you (or that you even need it!). The people who will benefit the most from this essential serum include those with mature and damaged skin. But even if you are in your 20's you will still find value in using this serum daily! Are you using this essential serum? Does the price have you second guessing the purchase? What products are you using that are working for you?